Last year, I wrote a review of all of my timber frame books. But since then, I've acquired a new timber frame book worht mentioning. It's called "Discovering Timber-Framed Buildings" and was written by Richard Harris. The author is English, and it was actually one of his former students, Ken Hume, from across the pond that turned me on to this book. It's a small paperback, presumably meant to be carried with you whilst you galavant about England "discovering timber framed buildings." The author gleaned a lot of the information for this book from personally inspecting, cataloging, and drawing historical timber frame houses and barns in England. In spite of its small size, there are several gems of information contained within this book that I haven't found elsewhere. For instance, the author goes into considerable detail about the different styles of cruck frames found in various regions of England. 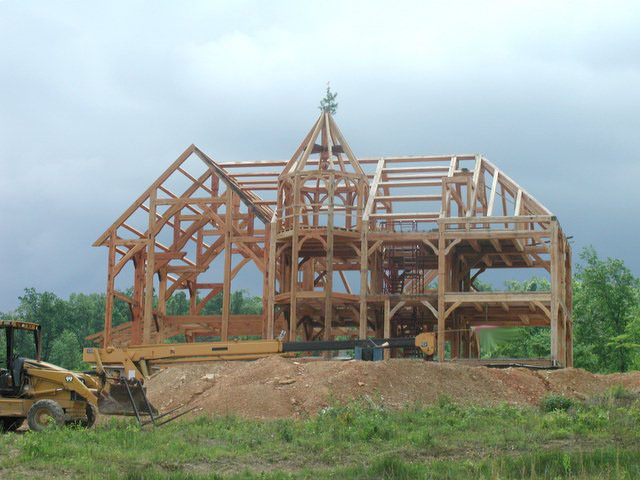 Contrary to conventional wisdom, this author maintains that cruck frames were a highly evolved form of the timberframe craft rather than a crude precursor to the more linear timber framing practiced today. (I really want to build a cruck-framed entrance for our house now!) He also covers hammer beam structures, jetties (overhangs common in cities), and the "rafter-to-post-connection for hip roofs" better than any of the other timber frame books in my collection. This is not a how-to book. Instead, I'd call it a very compact historical reference volume on English timber frames. If you already have how-to books on timberframing, or if you simply want to better understand the history of timberframing, then this one is definitely worth adding to your collection. More about the photograph: My timber frame library is housed within a huge mortise in the Big Honkin Post (BHP for short). The BHP is a post in our basement that holds up the middle of our house. I left the bark on the bottom of the post, and sawed the upper portion of the post to 16" by 20". This left plenty of room to hog out a bookshelf for my most coveted volumes. Fortunately, the newest addition to my library is thin and fits (squeezes) into the mortise with the rest of the books! In the process of roofing our house with slate, we generated a pile of scrap pieces of slate. Most of the scrap was the result of cutting the slate to form hips and valleys. A very small amount of the scrap was slate that had faults, pyrite, or other defects from the quarry that kept us from putting it on the roof. And yes, I'll admit, I missed a nail or two on the roof and generated a few randomly shaped pieces with the slate hammer. No worries though; slate is an amazingly versatile material. This week, we dug into our stockpile of scrap slate and started manufacturing slate flooring. When I ordered the slate roofing from the quarry, I specified 1/4" to 3/8" thick slate. This thicker slate is a little more durable than the standard 3/16th slate and gives a more textured look to the roof. The extra thickness is also nice if you want to convert your scraps to flooring material. When I bought the slate roofing material, I also bought just enough "shadow gray" slate flooring to do the sunroom in our house. The tractor-trailer that came from Camara Slate in Vermont to our house in Kentucky had 40,000 pounds of slate on it, and was capable of hauling 43,000 pounds, so shipping was essentially free for the flooring slate. The factory slate flooring material served as our benchmark for making our own flooring from the scrap roofing slates. In fact, we copied the suggested pattern and sizes right from the factory box. To make the most of our roofing scraps, we scaled down the factory pattern by a factor of 1.5, so our biggest piece was 8"x8" instead of the factory 12"x12" size. Having real slate flooring on hand was helpful. For instance, I measured the factory slate flooring and realized that the dimensional sizes were 3/8th's of an inch smaller than the nominal sizes - duh - obviously to allow for grout. We made ours 1/4" undersized to accommodate smaller grout joints. The factory slate flooring was milled on the back side so that each piece was exactly the same thickness. The flooring we made was not as consistent in thickness, but served our purposes just fine, so long as we kept the thinner slates out of the finished pile. We used a borrowed wet tile saw to cut the slates. It has a diamond blade which costs $80 to replace, but I have noticed no wear on the blade so far. At least that's what I'm going to tell the guy who loaned it to me! :) I was disappointed to find that we could only cut about 5 square feet of slate flooring per hour. That's about 20 pieces. If you value your time at $10/hour and slate scraps are free, then you will have at least $2 per square foot invested in recycled flooring of this type. Egads, now I see why so much crappy slate is shipped here from India and China. And I'm amazed that Camara Slate can dig this stuff out of the ground, split it by hand, cut four sides, mill the back sides, wash it, and package it for less than $4 per square foot right here in the USA. If you buy slate flooring from Lowes at this price, I figure you're giving Lowes $2, China $1, and the oil companies $1 (shipping) and getting an inferior product, so why not buy it direct from a USA quarry? Or recycle some scraps if you can get your hands on some. On the right is a picture of our slate flooring factory. The location was chosen for shade (sun doesn't hit this corner until 2:00 pm), but now I see that we're going to have to pressure wash slate sludge off of our stone wall. Oh well. When this picture was taken, we had enough slate to get started on the floor in our upstairs bathroom. Prep for the bathroom started with screwing down 1/4'" HardiBacker underlayment to the plywood subfloor. Cutting hardibacker is somewhat like cutting drywall - score it with a utility knife and bend. It took over 50 screws to secure each 3'x5' sheet of Hardibacker to the subfloor. My wife went dowstairs and watched each screw as it came through the plywood, in order to make sure that it hadn't hit the radiant heat tubing beneath the subfloor, and in order to direct the placement of the next screw. We were yelling directions back and forth to each other, to get above the din of the wet saw, being operated by our help that day. This process was nothing short of maddening. Our conversation sounded something like a game of battleship-turned-domestic-dispute. "DID YOU SEE THAT LAST SCREW?" "NO, I THINK IT HIT A FLOOR JOIST. WAIT, I MEAN YES, THERE IT IS." "NEXT ONE IS GOING 12 INCHES NORTH, OK?!" "NO, NO, YOU'LL HIT THE TUBING, GO 6 INCHES EAST!" "WHAT? I CAN'T GO THERE!" "JUST WAIT, I'LL LOOK FOR MYSELF." Like I said, maddening. I was glad when that part was done. I left to cut hay while my wife cleaned the slates. The next morning, harmony had returned to the house site. We were eager to get started laying the slate tiles, but soon discovered that the thinset mortar we had on hand needed more than just water. In spite of what the man at Lowes had told us, the cryptic trilingual instructions stated that a "latex fortifier" was required. So, off to the store we went. We found a flooring company, instead of Lowes, and bought thinset mortar with the latex fortifier already incorporated. Supposedly, a latex based thinset holds better and retains some flexibility. After laying a test pattern, we mixed the whole 50 lb bag of thinset (a mistake?) at once and got to work. I learned the hard way not to spread out too much thinset in advance of placing the tiles. More than once, I scraped thinset back off the hardibacker because it had cured too much before we got the tiles placed in that area. The mortar cures pretty fast once it's exposed to dry Hardibacker and air. Even the mortar in the bucket started setting up, so I added a little water to the thinset twice before we were finished. It would have been better to mix two half-batches of thinset mortar, instead of mixing the whole bag at once. The little white spacers in this picture were helpful for keeping the joint spaces consistent. At one point, I tried laying a section of the floor "by eye" without the little white spacers, but I quickly went back to using the spacers. The pattern looks random, but it repeats itself in both directions. When we got to the walls and door threshold, we improvised with the pattern to make things come out right, and to avoid having little slivers of slate. We had to cut a few custom tiles as well at the walls. Just as with our roof, these slates were a 50:50 mixture of Vermont Unfading Green and Vermont Unfading Gray. And just as with the roof, I can identify at least four different colors of slate in the mix. The day after we laid the tiles, my wife cleaned them and sealed them. The idea is that sealing the slate before grouting makes them easier to clean after grouting. Even with the sealer applied, we thought it would be difficult to clean the grout from the slates, so we started by trying to apply the grout very deliberately and neatly. We went so far as to load the grout in an empty caulking tube, and used a small trowel to strike the joints. We were literally wallowing in our own ignorance, but muddling through, when we heard a car pull up to the house site. Oh great, I thought, another distraction and here we have a full bucket of grout setting up in the bucket! (you would think that I would have learned from the thinset mortar experience, not to mix the whole bag at once, but I had not learned!) Anyway, the distraction in the driveway turned out to be our savior. The stone mason had come to get his wheelbarrow. He looked at what we were doing, realized we were in over our heads, and said, "Oh my gosh, you mixed way too much grout. Is that stuff on the floor set up yet?" Instead of laughing at us, he asked where our float was. "Um, still in the bag." He told us to get him the float, and he proceeded to show us how to grout joints. He began by smearing grout everywhere... even all over the clean slate tiles we had already grouted. Using the float, he worked the grout into the joints. Sixty seconds later, like a midwife delivery a baby, he directed us to get him two buckets of water and two clean sponges. (our sponges were still in the bags too!) He made successive passes across the tiles, rinsing the first sponge between each pass. When all that remained was the haze of grout on the slate tiles, he took the cleaner sponge and wiped the tiles clean. The grout looked perfect and the tiles were clean. He had made it look even easier than the stonework. He handed us the float and sponges, said "my grandkids are in the car, good luck" and with that he left us to finish the rest of it. The 3 minute hands-on lesson that the stonemason gave us was worth hours of book reading. Our stupidity was immediately obvious to us and we switched to his way as soon as he left. Enlightened, we finished the floor quickly, and it turned out great. In this final picture, the tiles were still slightly wet, so the slight haze of grout residue is not very visible. When the grout has dried, and the haze on the slates becomes more visible, we will clean it off with dry cloths and/or saw dust. Then my wife plans to apply sealer to the slates and the grout. At the very right side of this picture, you can see where we left out a few slates, because we have not roughed in the plumbing for the toilet yet. Hopefully, by planning for the toilet, we won't have to drill through the slate flooring to plumb it. We plan to do our foyer and mudroom with scrap slate from our roof as well (but with darker grout). It should go much smoother. And of course, we can't wait to lay the factory slate flooring that we bought for the sunroom. That should be a walk in the park, compared to the steps we've gone through to make this bathroom floor.